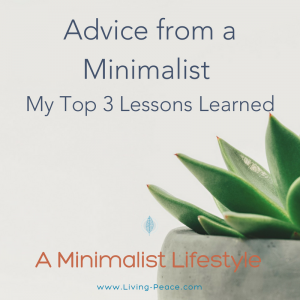 To dive a little deeper into my experience living a minimalist lifestyle, I would like to share three pieces of advice – three life changing lessons I learned in a few areas of my life that I found I was pleasantly surprised to develop over the past year and a half as a minimalist. I bet it would be no surprise to you if I said that being a minimalist means I save more money. I do. What may not be so obvious is how my relationship with money has changed. I’m sure you’ve read and heard a hundred times that money doesn’t bring happiness, yet with the opposite belief so deeply ingrained in our culture and our psyches, it’s difficult. It took me becoming a minimalist to really register that money is a means to an end…that we can work to live and not live to work. What’s your mindset on money? Check in with yourself. Sometimes easier said than done, but there are small steps we can take that lead to a big shift in our whole mindset on money. For example, start to practice just being aware of the why you buy something … buy anything. Ask yourself, “Why am I buying this?” Whatever your answer is, then ask “Why?” again. You may need to ask yourself why a third time, but keep asking until you get down to the deeper, real reason you are buying it. Then choose to buy it or not from this more conscious place. When this truth sinks in, and when you don’t get a charge from buying something you don’t really need, then you’re ready. Until then, let yourself buy it. Don’t beat yourself up if you find you don’t “need” it but still want to buy it! We live in an age of consumerism. We come face-to-face with the opportunity to buy things all the time; driving down the highway lined with discount stores, walking down the city street with shops full of items on sale, or online as enticing ads pop up. Did you know that Retail corporations have 52 fashion cycles to sell more per year now? We are bombarded with subtle or not-so-subtle messages of “If you have this, you´ll be happier”. Advertising does its best to tell us what’s worth spending our money on. I remember realizing that the new hair and skin products that always promise breakthroughs have been the same main ingredients for decades, with only a few minor alterations, yet we are lead to believe they are new, must haves. All of this is to say, keep the big picture in mind when it comes to consumerism. After the Great Depression, the pendulum swung toward frugality and stashing. Now it has swung toward convenience and the quest for happiness through buying stuff! So, keep it in perspective. Is your #1 hidden commitment to look and feel good through things stifling your creativity, and hijacking your mind? Every item that you buy forces you to make decisions, whether you realize it or not. “Where should I keep this?”, “When would I wear this?”,” Should I fix this today or later?” When I let go of two thirds of the stuff I owned, I had fewer decisions to make. Being responsible for less stuff gave me mental space, which fosters creativity, so now I innovate more and make better choices throughout my life. Mark Zuckerberg and Vera Wang are known for wearing the same uniform each day. Mark wears jeans and t-shirt and Vera, a black Gap t-shirt. They say it’s because it’s one less decision to make, leaving mental space for getting creative and focused on what’s really a priority, like living your dreams, and not keeping up with the Jones’. My smaller wardrobe, ironically, makes it so much easier, faster, and more fun for me in selecting an outfit each day. Keeping up with the Jones’ hijacks your mind. According the National Science Foundation, we think 50,000 thoughts per day, and most of them are repeated day in and day out. How many thoughts do you think you have about how you appear, look, or sound to others? How many thoughts would you guess revolve around using or buying things to look good to others? This wasted mental energy may not be so clear at first, so again I’ll suggest applying the “Why?” method, adapted from professional organizer Marilyn Paul. Ask yourself why you own a belonging, any belonging. Then ask yourself why again. And then maybe one more time, like how a young kid asks a parent “Why?” as many times as they can get away with. Peel the onion to find the core reason you own something, to become more aware of how much attention you’re giving it and energy you’re exerting – attention you could choose to exert on thoughts that could have more meaning for you. In summary, my top three pieces of advice as a minimalist and an organizer are to explore your mindset around money, stay grounded & keep perspective in the face of consumerism, and that keeping up with the “Jones’ ” drains your energy and is fruitless! Are you applying minimalist principals in your own life? Would you like to? Let’s talk! Please share your comments, thoughts and experiences below. 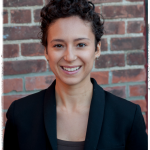 If you would like additional support in integrating minimalist principles into your life, schedule a session today with a holistic organizer. We can help!